One of the greatest challenges for the apparel industry is to produce garments that fit customers properly. Anthropometry, Apparel Sizing and Design addresses the need for improved characterization of our populations in order to tailor garments according to size, weight, and shape of consumers. This book reviews techniques in anthropometry, sizing system developments, and their applications to clothing design. Part one considers a range of anthropometric methods. The text discusses the range of sizing systems, including data mining techniques, useful for bridging the gap between ergonomists and designers. Chapters examine three-dimensional anthropometric methods and multivariate and bivariate analysis for identifying key body dimensions. Part two then explains how to analyze anthropometric data to develop appropriate sizing systems. Here, the book discusses classification and clustering of human body shapes, the importance of national surveys, and using the data obtained to ensure inclusive design strategies. The book covers sizing systems developed for particular groups, apparel size designation, and the potential for international standardization. It considers the advantages of 3D body scanning and computer-aided design, and the use of body motion analysis to address ease allowance requirements of apparel. 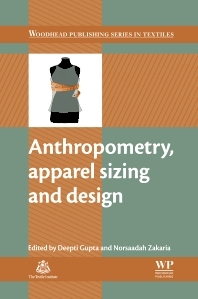 With its distinguished editors and international contributors, this work is an essential reference, particularly due to the specific combination of aspects of anthropometry and the sizing of clothing, for researchers, garment designers, students, and manufacturers in the clothing and fashion industry. Dr. Deepti Gupta is Professor in the Department of Textile Technology at IIT Delhi, India. She completed her PhD from the same department in 1995 and joined as a faculty member in 1997. She has 18 years of teaching and research experience and has published more than 40 papers in national and international journals of repute. She has guided two PhD and several M.Tech projects at IIT. Dr. Gupta has conducted research on the problem of body size chart development for the Indian ready-made garment industry for the last 6 years. She has published several papers in international journals and spoken at national and international conferences on the subject. Her team has generated a huge database of accurate anthropometric data of various segments of the Indian population. This has been analysed extensively to propose a unique, computer aided solution to the extremely complex problem of garment sizing. Dr. Norsaadah Zakaria is currently the Head of Clothing Technology and Fashion at the Institute of Business Excellence, Universiti Teknologi MARA, Malaysia. She has organized training and offered professional APD clothing and design technology programmes in collaboration with the Telestia-AB Fashion Centre, Greece. Dr. Zakaria completed her research in body size and shape of 2500 children aged 7-17 years old in Malaysia. She was previously on the main research committee for the organization of national research on Saudi Size in 2015, and managed to secure the national grant to develop the first anthropometric data for Saudi Arabia. Her main research interests include traditional and 3D body scanning anthropometric survey, modelling and data for clothing sizes, shape analysis based on anthropometric data, and sizing system optimization and validation using data mining. She is now pursuing research on adult anthropometric data for women, using Telestia-AB technology to develop pattern making for improving clothing fit and sizing.